Berlin CSD was honored with the highest School Safety Excellence Award from Utica National Insurance Group. This is the second year in a row the district has received a safety award from the group. Each year Utica National recognizes schools for safety in categories such as playground safety and bullying prevention. 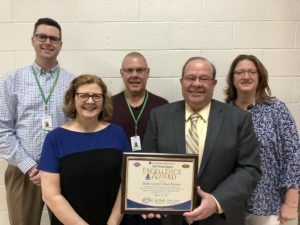 Berlin Central School District officials accepted a certificate to commemorate the district’s safety efforts and a $500 award for use in furthering those efforts from Utica National representatives.